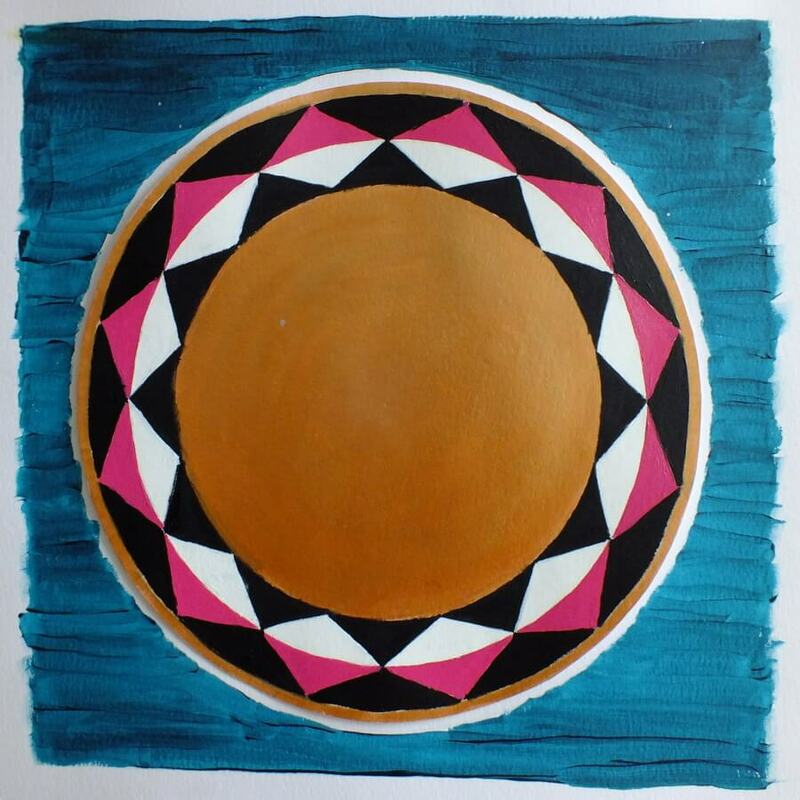 The Mandala Days Art Gallery includes a selection of work created by participants in response to a series of twelve invitational modules, delivered over the space of twelve months. 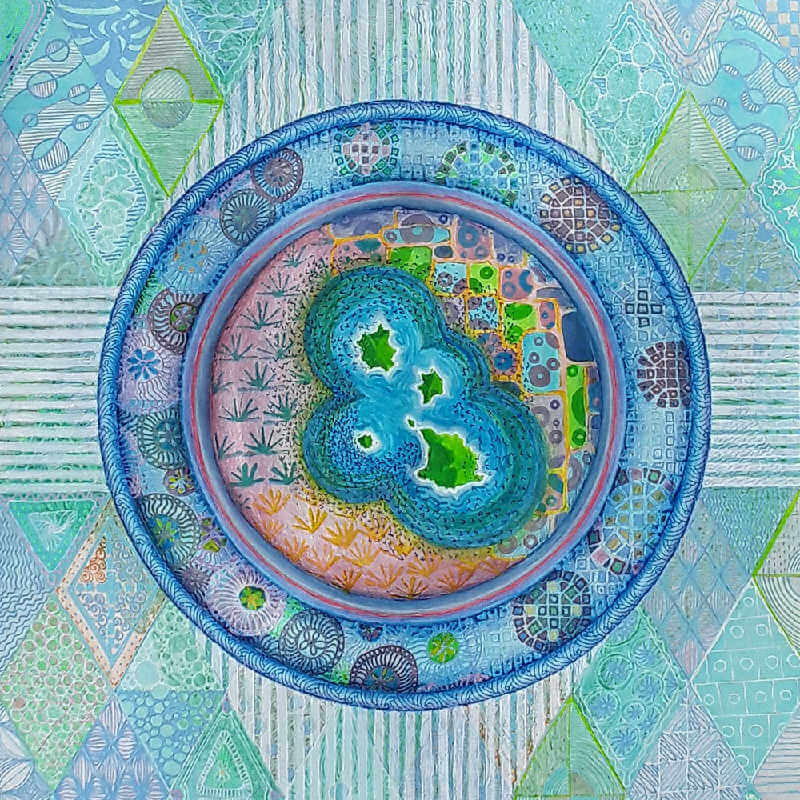 The wide variety of styles and forms is indicative of the non-directive nature of the program, where artists were encouraged to create mandala art using their original voice in response to a wide variety of subjects, including mandala as symbol and archetype, expressive dreamwork device, medicine and ceremonial aide. Invitations were also issued to consider subjects such as personal expression, personal relationships, an exploration of the meaning of time and their relationship with nature, life and death. What you see presented here is a small selection of work from a group of artists with various skills, experience and abilities. 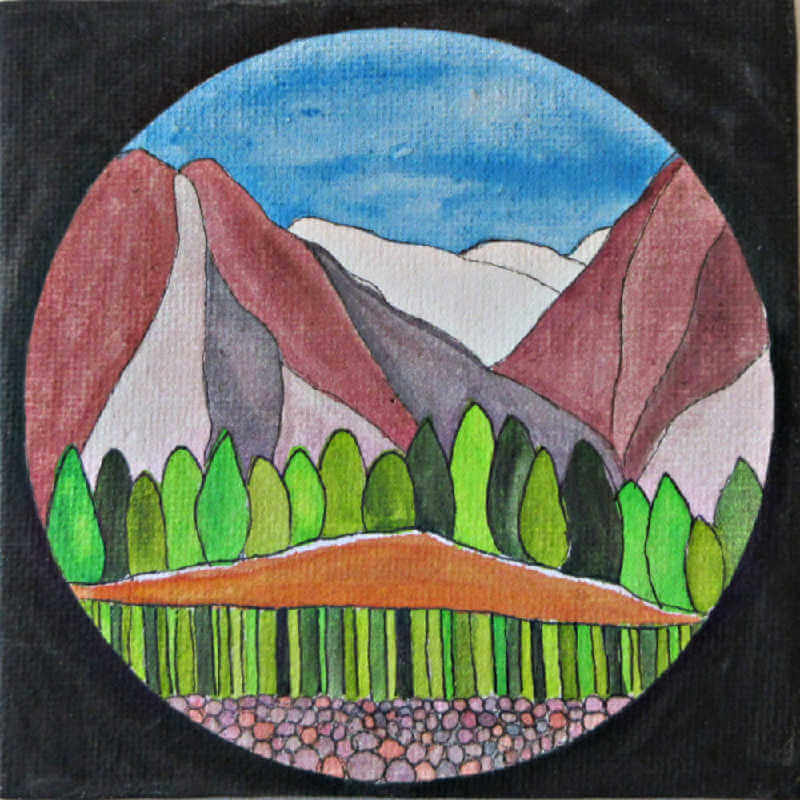 What they share is a dedication to their creative practice and the art of inquiry – inquiry as deep, inner work and as a response to the current external environment. It is always a humbling experience to accompany artists on a road such as this. Please take some time to enjoy, and be sure to visit the Artist Pages to find out more about each curious, creative and capable individual. Thank you! Directly inspired by time spent exploring Kilmartin Glen, Britain’s richest archaeological landscape situated in Argyll, Scotland. This land was of great significance to our ancestors, evidenced by a prolific amount of Neolithic + Bronze Age archaeology, including significant crops of rock art whose cup and ring carvings are echoed in this piece. 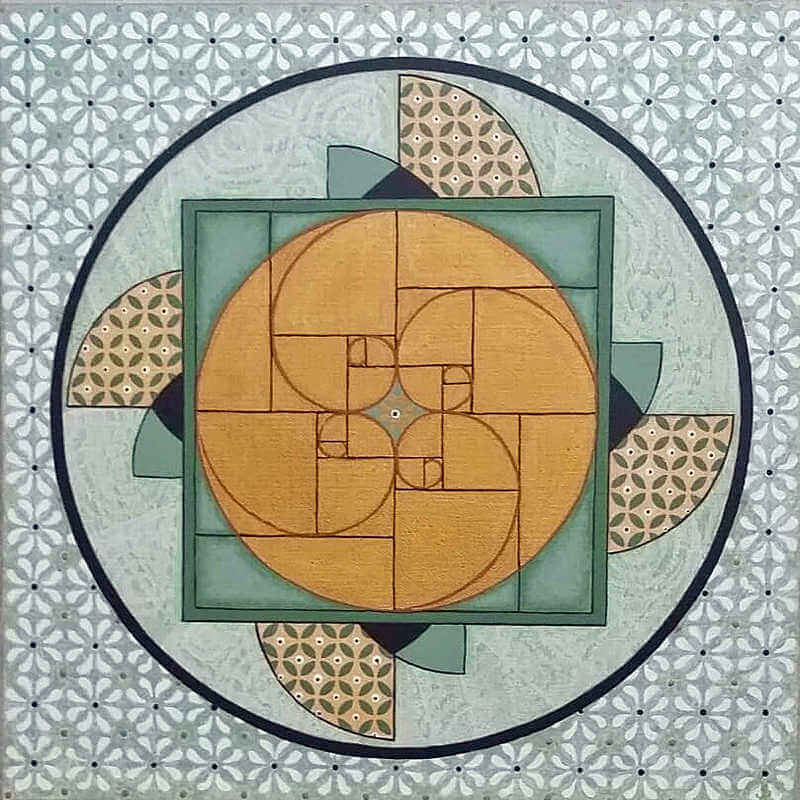 Within the simple complexity of the universal laws of nature we immerse all of our senses to the eternal wisdom of divine geometric proportion. Like a rich golden thread woven into the tapestry of creation, we become in harmony with the rhythms of the seasons through this union. We realise we are connected with the infinite pattern of love. We become Love. An empath is trained from a young age to perceive the feelings of others as a mechanism to discern safety and danger in people, beginning with her family. For the rest of her life, the needs and feelings of others continue to show up in her experience of people. She can choose to suppress them or explore them. In either case, she needs a refuge from the constant, unwanted intrusion and the pull on her resources. Inspired by a photograph I had taken during my time in Kenya in 2009. The giraffe symbol kept appearing to me in various forms in early 2018 and seemed to hold a message of completion & letting go of sadness related to loss and grief. 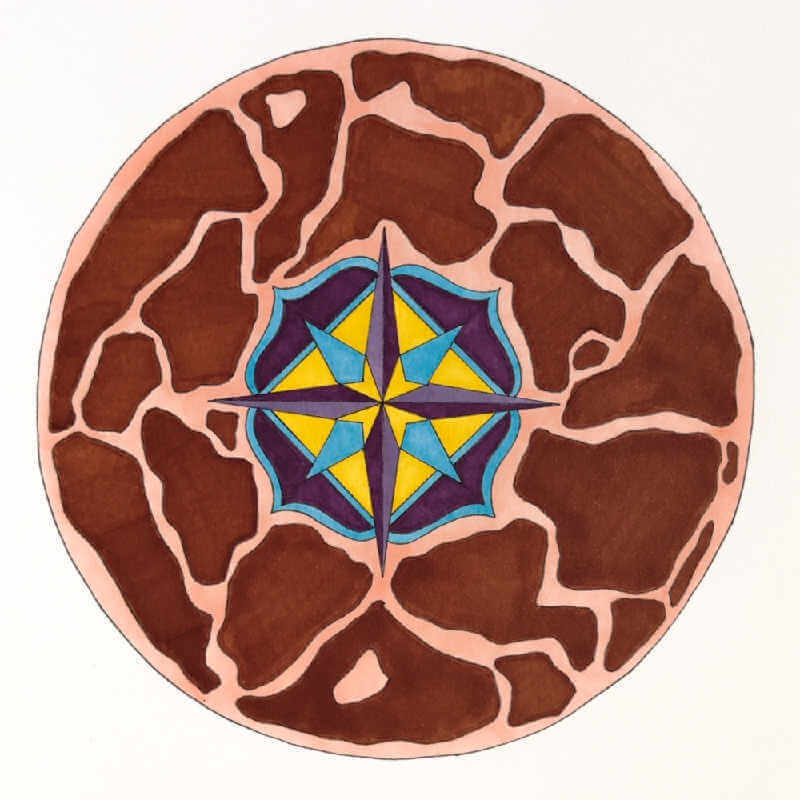 I love the bold colours of the compass in the centre, suggesting travel/islands and a new direction. 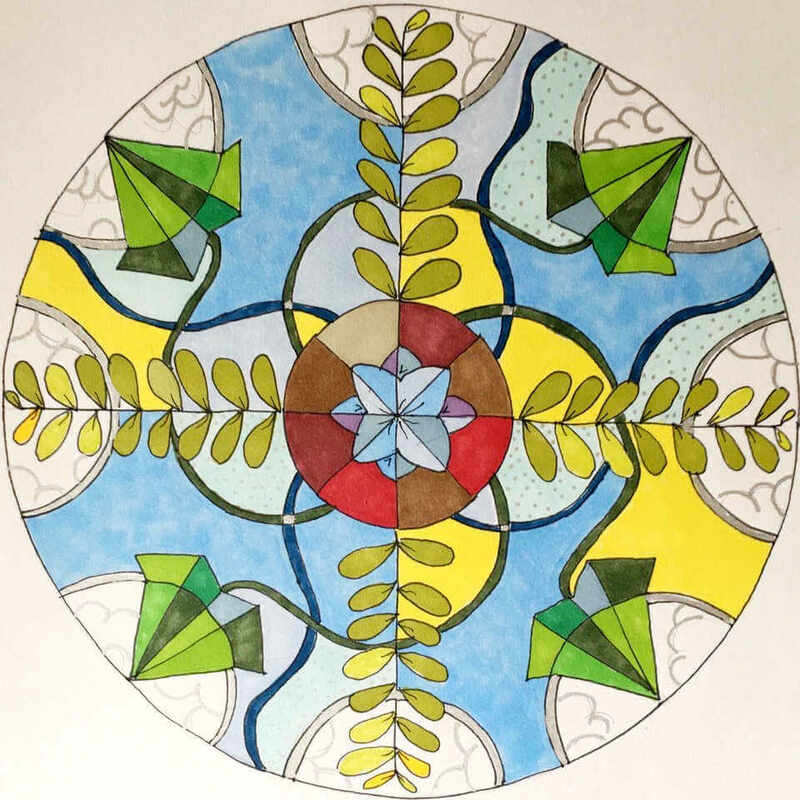 This mandala is my representation of the classic tree of life symbol. It encompasses the dualities of day and night, what we see above and what is hidden below, all the mysteries of life and the unknown after-life. In my own small way I am simply trying to make sense of the world! 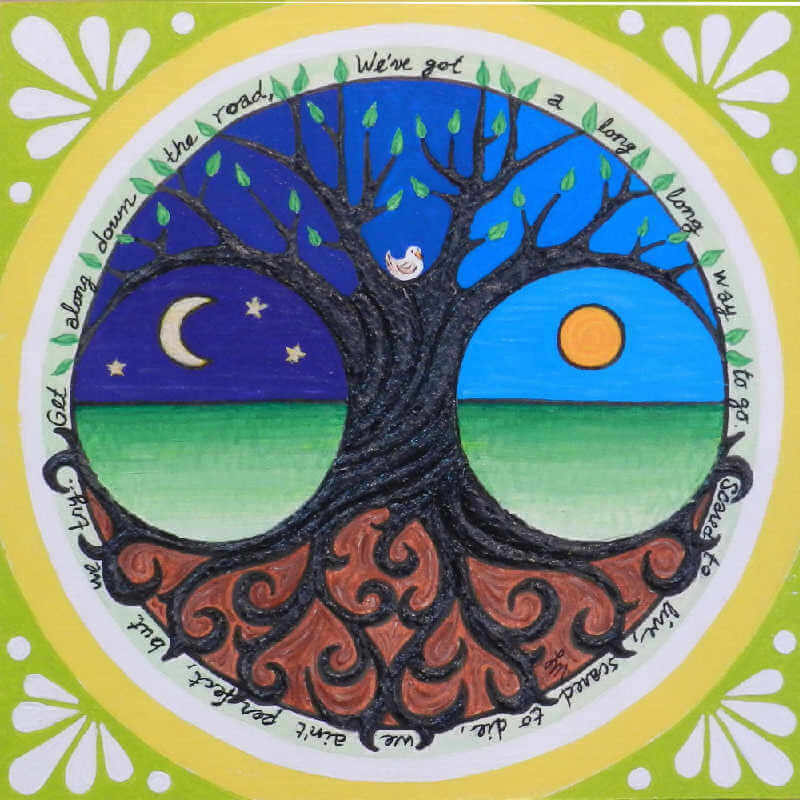 Note: the words written around the circumference of the mandala are from the song “Get Along” by Kenny Chesney. 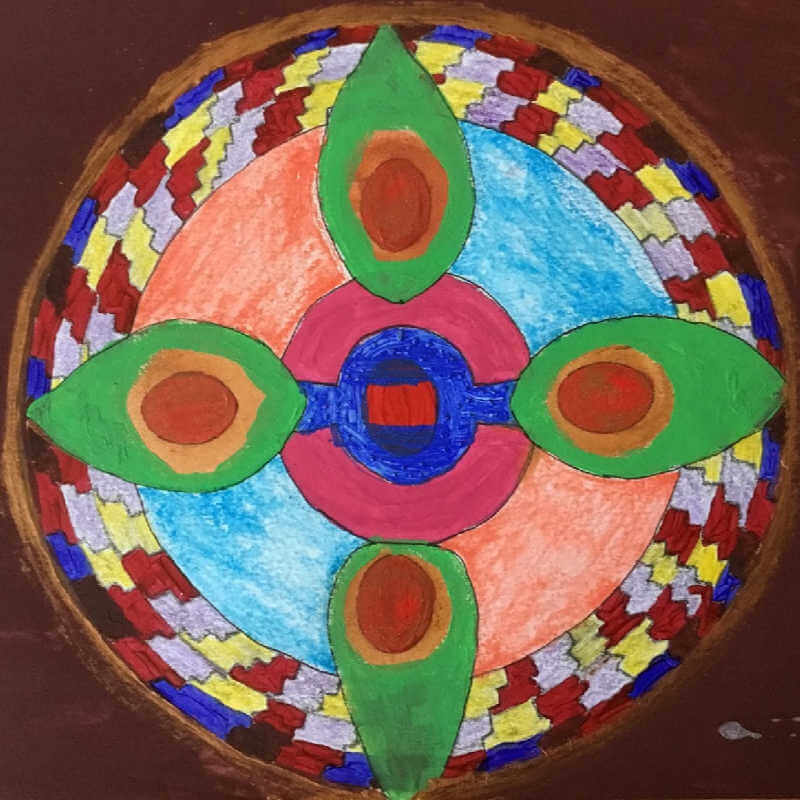 This nature mandala expresses the possibility that dancing can be as subtle as leaves floating on water. She told me: “Your dance can be light and liquid, yet there can be stillness under all of the movement”. Freedom within structure. Structure within freedom. 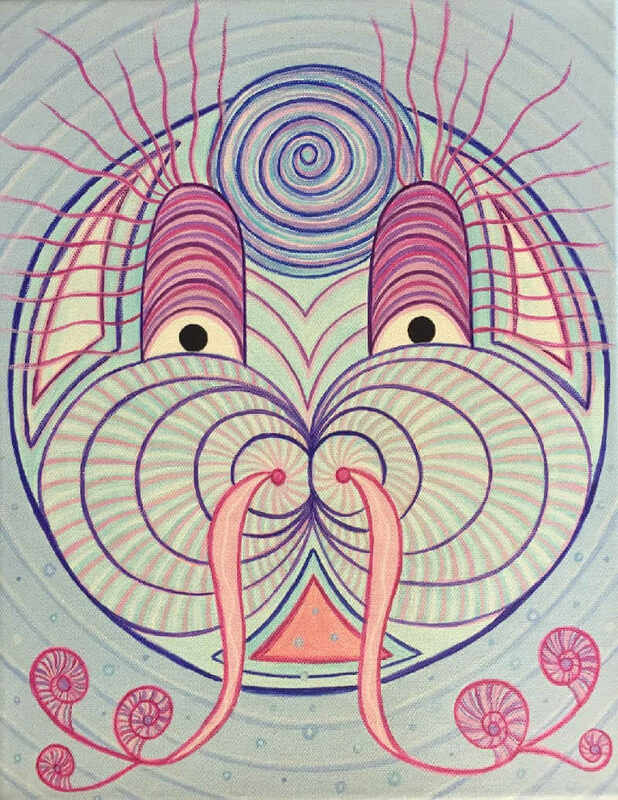 One step at a time, from the surety of the strong centre this mandala grows outward without any sense of planned for outcome. 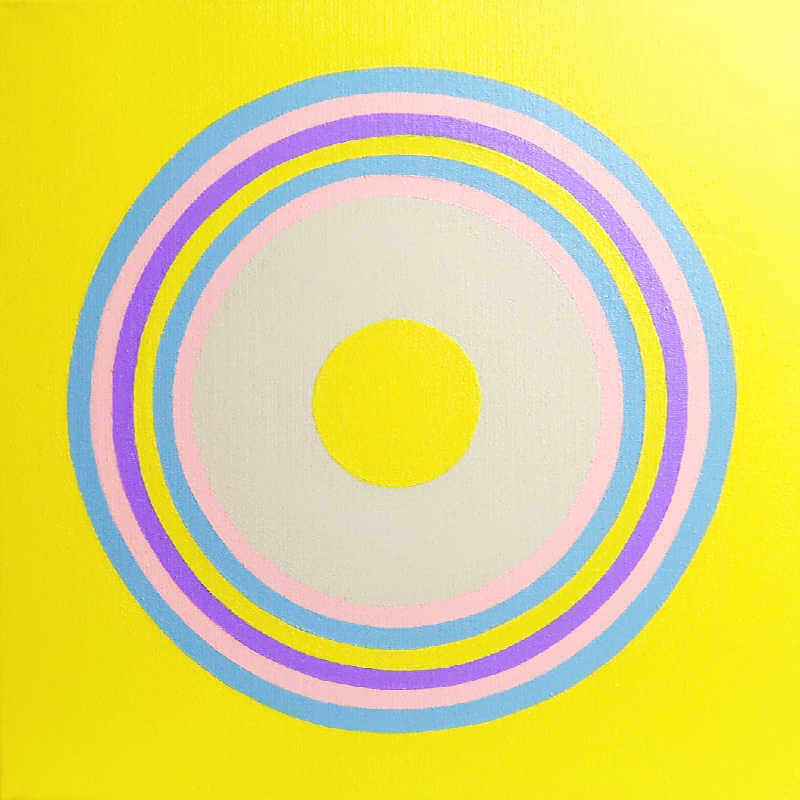 One ring at a time, colours added with each circle. 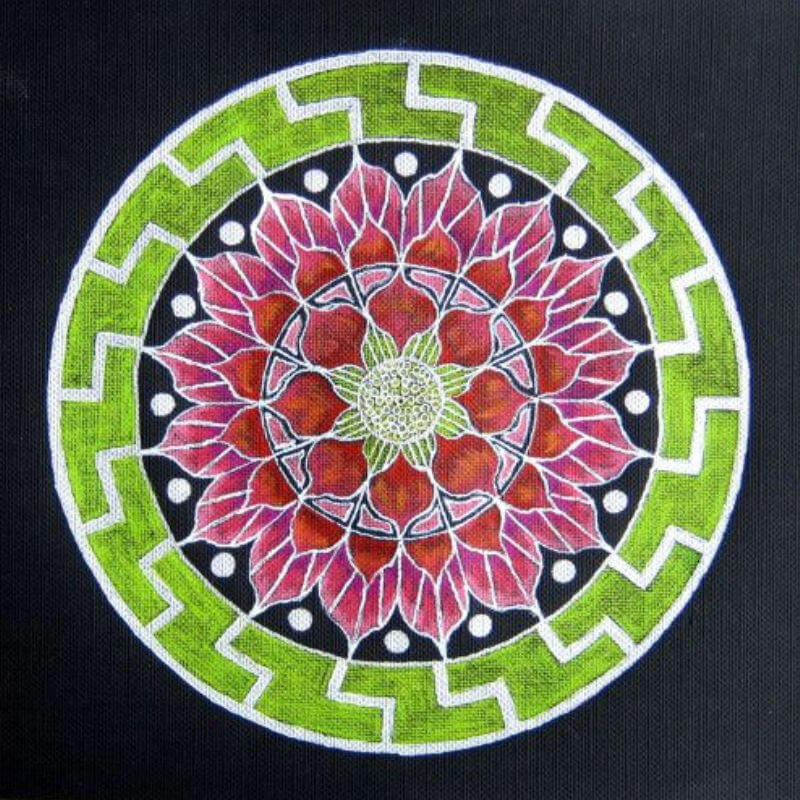 Listening to the direction from within me, bit by bit, this mandala appears. A creative becoming, as I learn to hear from deep within. I started this piece by remembering parts of a dream that I had about opening up. Originally it was in the physical sense like opening your arms for a hug. After thinking about it further I thought maybe it’s about a plant or flower opening up. When I started drawing all I could think about was the shape and colour of avocados. It makes no sense but most dreams don’t. A joyful expression of creative energy. 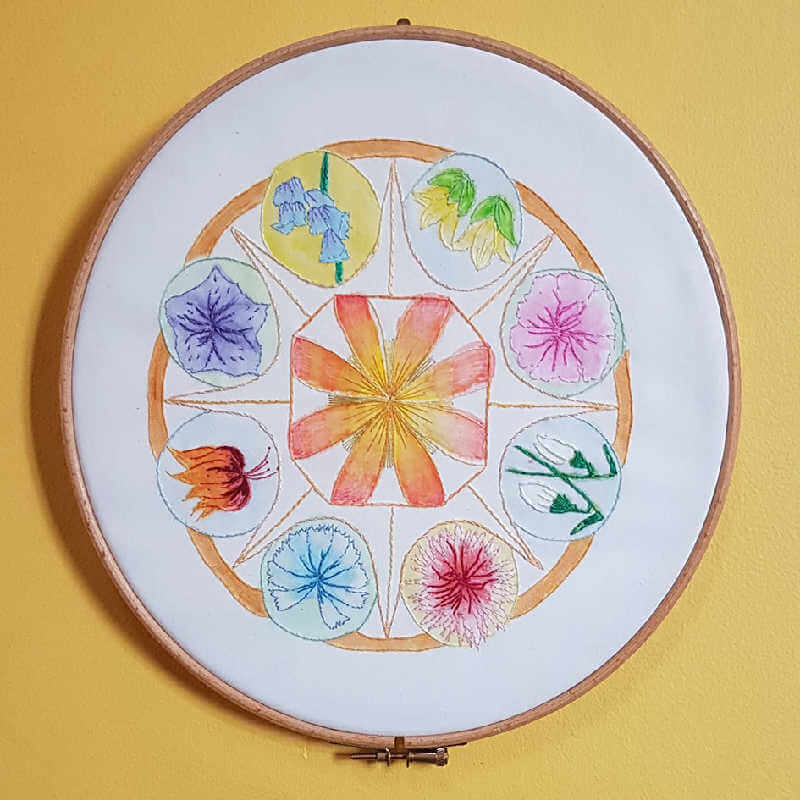 This is inspired by my love of the colours and shapes of flowers and plants, and represents the communion of nature that holds everything together in harmony and unity.